I am a big fan of Grace Lavarro’s Instagram account @Jewels by Grace. The antique jewelry pieces and gemstones featured are of course fantastic but what I really enjoy the most is the captions. Grace is very knowledgeable when it comes to jewels from the past, their story, the people who wore them or a specific era. Yet she doesn’t come across as pedantic or dry, it’s always fun! I really enjoy some good gossip on Queen Victoria’s love life and a reminder of how the Art Deco movement came to be. I sat with Grace for a short interview as she is a very busy woman! Tell us a little bit about your personal story and how you ended up in the antique jewelry business. When I get asked this question (which is often), I tell people that I am a fluke. I started out as a modest collector who, at some point, realized that I could possibly make a living at something that I just absolutely love. I would say that my career and my start in this business resulted from a perfect combination of serendipitous circumstances, hard work, long hours, personal sacrifice, and just sheer will. I asked a lot of questions, learned from the best, only work with the best, and most importantly, I trusted my instincts and believed in my own aesthetics. My “AHA” moment came when I saw Oprah advocate on her afternoon show that we should all find our bliss. And jewelry is definitely one of my life’s bliss. This is now my 10th year in the business, and my 3rd year as a solo enterprise. I have loved every minute of it – how can you not when you are surrounded by beautiful objects all the time and people come to you in celebration of love and unity? I have always said that my business is not one of selling beautiful jewels, it’s a business where I get the pleasure of helping immortalize some of life’s most beautiful moments. 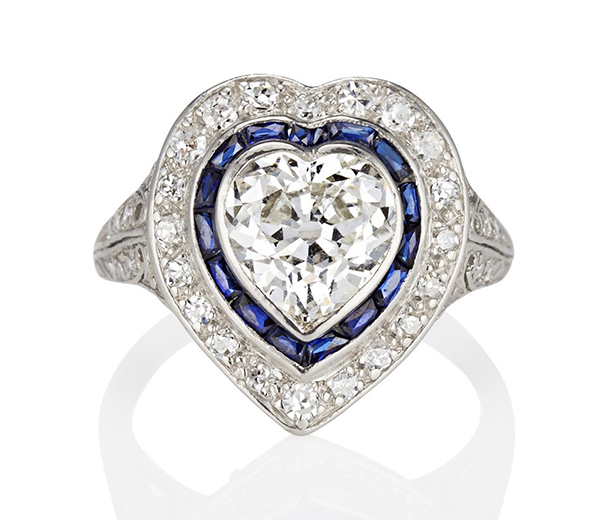 You talk about antique diamonds having souls, I love that. Can you elaborate? When I look at an antique diamond, I liken it to looking at a woman whose eyes crinkle at the corners when she smiles, with some lines across her forehead, a wrinkle or two marring her face. That would be the face of a woman who has lived, loved, smiled, laughed, cried, and perhaps lost. Likewise, antique diamonds have survived several generations, 2 world wars, horses, buggies, and everything in between. In the course of all this, they too have developed crinkles, wrinkles, laugh lines, and life experiences – a soul. So they will always be ever so slightly wonky, slightly asymmetrical, some might even have minuscule nicks and chips along the girdle – all signs that they were fiercely loved and often worn. The perfect imperfection in the old cuts is their soul and character to me. Quick Antique Diamond 101 for our readers. 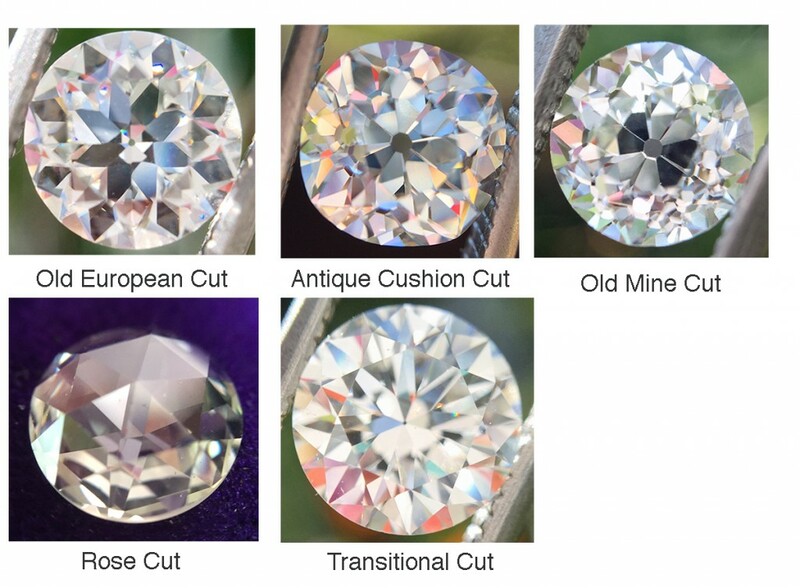 What diamond cuts are considered antique? The following are all antique: rose cut diamonds (among some of the earliest diamonds to have been cut and polished), old mine cuts, antique cushion cuts, old European cuts, and transitional cuts. Old mine cuts and antique cushion cuts are the “chunkiest” of the old cuts out there. The facets are rather random, quirky, and a little more rustic. They are typically on the deeper side in terms of depth as well, but I find them to be the most fiery of all the old cuts. They just give these big, bold flashes of jewel tones. Cushion cuts are shaped just like they are called – like little pillows. Old mine cuts tend to be soft off-round in shape, with an almost quilt-like face pattern around the perimeter of the table. These cuts are very very charming, and decidedly antique. Old European cuts are round, with predominantly good symmetry yet still has those big, broad facets. They range in make from pretty chunky for the early-cut OECs to blocky. Some of the most desired makes are those in which you see a petal, or snowflake pattern under the table. Transitionals are the old cut cousins most similar to both old and modern cuts. Symmetry is pretty tight, and culets are either small to very small. As the precursor to the modern cut diamonds, transitional cut faceting are less broad, but instead tend to be skinnier. Most also face up with a “checkerboard” facet pattern. My very first sizable old cut was a transitional (which I regret selling to this day!). 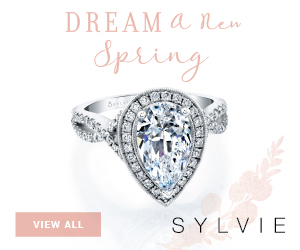 You also create new settings to set antique or re-purposed diamonds, what is your process? 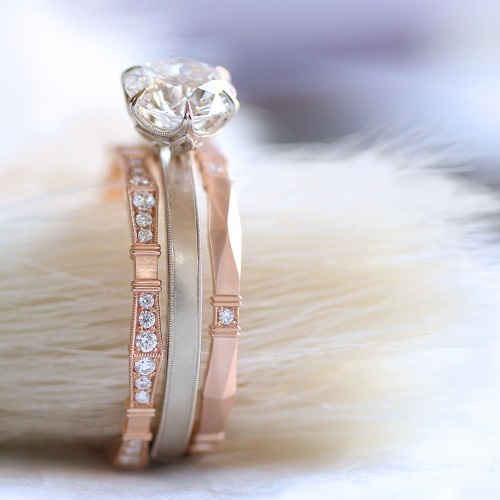 When asked to help a couple design a ring, I like to make sure that the design we come up with is a design that reflects the wearer’s personality, tastes, and life style. Does she work a lot with her hands? Is her sporty? Is she ultra-feminine? Does she lean towards any of the jewelry eras in terms of styles? What band(s) does she plan on wearing with it? I give my thoughts on their initial design ideas and we collaborate. I have no fears with telling a client what they have in mind does not work, or perhaps unattractive – it’s my job. It’s a greater disservice to my clients if I sold them a diamond (or they come to me with a diamond), only to set it in something they end up not loving in the long run. I tend to lean towards designs with a nod to the Art Deco and Edwardian eras, but on a slightly less elaborate/intricate. Unless it’s a true vintage or antique piece, I lean towards designs which are cleaner and simpler. 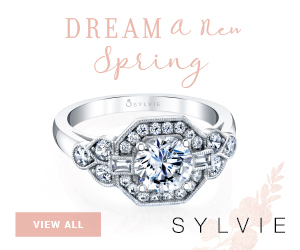 The ring featured below is featured an old European cut diamond set in Platinum. I noticed you also carry Erika Winters rings. Why did you fall in love with her work? 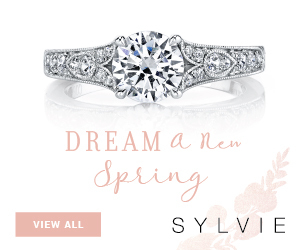 Engagement Season is about to start, any tips for our soon to be engaged couples when looking into genuine vintage jewelry? I would advise to try on an many different styles from as many different eras as you can. 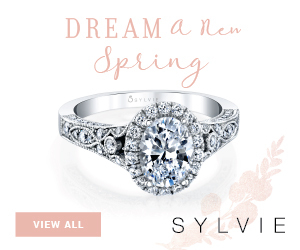 Only when you have a ring on your finger can you truly decide if the style is what you like. Do you like the history and age of the pieces from the Victorian era? Do you like rose cuts? If so, a piece from the Georgian-era might do the trick! 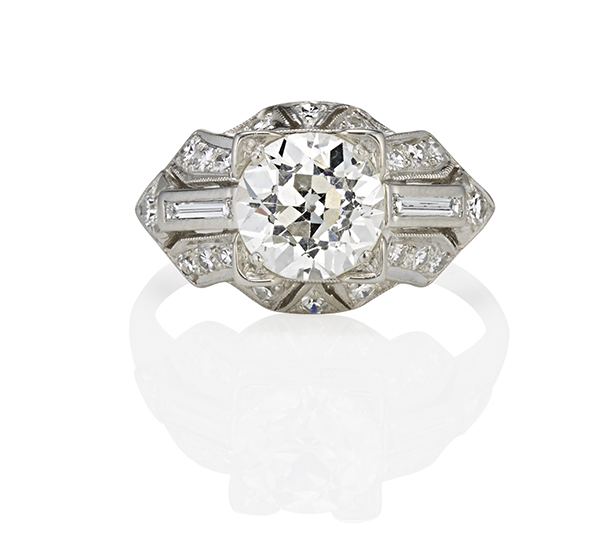 Perhaps a whimsical and feminine ring from the Edwardian era, known for their meticulous and ornate styling is the winner. And of course, there is also the clean, geometric lines of the Art Deco era. Also make sure that the antique or vintage ring you are acquiring is in sound shape. This is a ring that you potentially pass on to your own children so you want it to be in good condition and wearable. In some instances, re-shanking a ring, re-tipping the prongs, touching up the milgrain, etc. are all perfectly sound things to have done. Like a fine vintage car, jewelry also need occasional work to keep them looking their finest. Check out Jewels by Grace current engagement ring offering here .